The Children's Peace Monument in the Hiroshima Peace Memorial Park was built as a monument for peace and to commemorate Sadako Sasaki and the thousands of child victims of the atomic bombing of Hiroshima. Ten years after surviving the atomic bomb being dropped on her city, Sadako Sasaki died at the age of twelve from leukemia, a common disease caused by nuclear radiation. During her illness she worked to fold over 1,000 origami cranes, hoping this would bring her a wish for good health. She did not survive, but her legacy of folding cranes has. 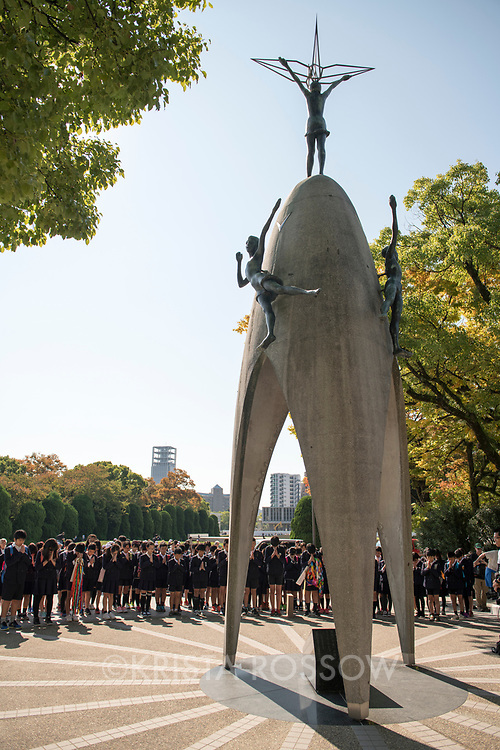 Now children from all over the world come to the monument inspired by Sadako to deliver or send paper cranes to the memorial as a prayer for world peace and the end to nuclear weapons.